HEERENVEEN, Netherlands (BRAIN) — Accell Group N.V. said it is considering selling its North American business, Accell North America, or right-sizing it down to a profitable size. HELSINKI (BRAIN) — The board of directors for Amer Sports has issued a statement in support of a bid by an investor group to buy the company's outstanding shares. Amer is the parent company of Mavic and Enve as well as an array of other sports brands. The investor group is led by China's Anta Sports. COLUMBUS, Ohio (BRAIN) — Gov. John Kasich has signed a bill making Ohio the 11th state with an e-bike law supported by the industry. LONDON (BRAIN) —The parent company of Rapha has filed an audited financial statement showing an operating loss of nearly 20 million pounds ($25 million) last year. The loss was due to exceptional administrative expenses incurred following the brand's acquisition in 2017; the company's gross profit was nearly 18 million pounds. HELSINKI (BRAIN) — Private equity investor consortium Mascot Bidco Oy has made a cash offer to purchase all issued and outstanding shares of Amer Sports Corp., currently valued at 4.6 billion euros (about $5.2 billion). This excludes shares held by Amer Sports or its subsidiaries. Should e-bikes be allowed on Mt. Tam? A forum is planned next week. MARIN, Calif. (BRAIN) — The Marin Municipal Water District will hold a public workshop next week regarding e-bike use in the watershed the agency manages on Mt. Tamalpais, widely regarded as the birthplace of mountain biking, and a local retailer is urging e-bike riders and supporters to participate in and speak at the forum. 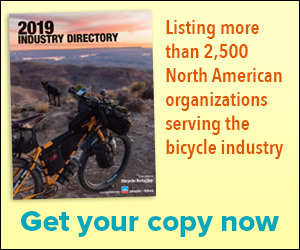 THOUSAND OAKS, Calif. (BRAIN) — Three bike industry veterans have launched a new consulting business for the emerging mobility industry. Mike Fritz, Jay Townley and Brad Hughes have formed Human Powered Solutions LLC. BERLIN (BRAIN) — When Shaun Paul Simmons first came to Germany, in 1997, it wasn't because of bicycles. "I came to Berlin for a girl and will now go back home for a girl," the American said with a laugh. HAAR, Germany (BRAIN) — The last of BionX Canada's operating subsidiaries, BionX GmbH, has announced it will close its offices near Munich on Dec. 10 after more than 10 years in business there and an unsuccessful effort to find a buyer. HOOD RIVER, Ore. (BRAIN) — Dakine, an outdoor sports lifestyle brand that offers bike clothes and bags, has been acquired by Marquee Brands LLC, a brand management company that owns the Bruno Magli and Body Glove brands, among others. Show also announces that Outdoor Retailer Magazine will produce its Show Daily. SAN JUAN CAPISTRANO, Calif. (BRAIN) — Outdoor Retailer said that all three of its shows in 2019 will be three days long. OR's Summer Market in June and Winter Market in November will be shortened from the original four-day plans. January's Snow Show remains three days as scheduled. HELSINKI (BRAIN) — Bloomberg is reporting that Chip Wilson, the founder of yoga apparel brand Lululemon Athletica Inc., is set to join the investor group that is trying to buys Amer Sports, which owns Mavic, Enve and other brands.